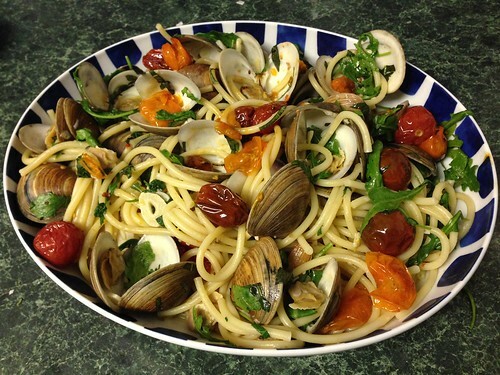 I stumbled across a recipe for linguine with clams in In Style magazine, of all places, and had to make it for supper. While shopping for game night supplies, I picked up a bag of clams for dinner later in the week. 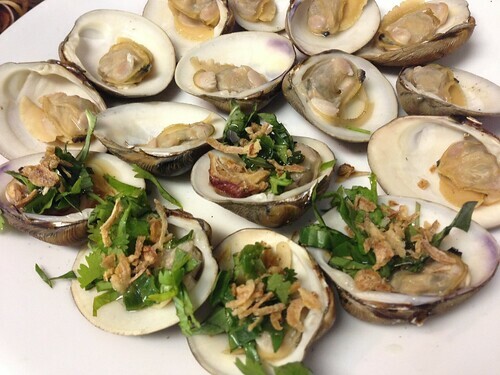 There were too many clams for dinner for two, so I decided to make a little appetizer of grilled clams – Vietnamese style. Turns out that this is another recipe that requires ingredients that are most likely already in your pantry or fridge. These grilled clams are perfect for a barbecue, Sunday Football or game night at home. 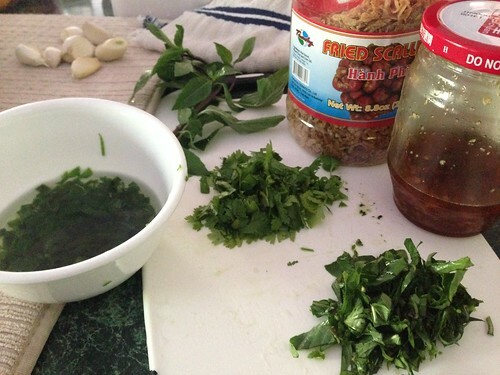 All you need is to chop some fresh herbs and top the grilled clams with a few other staples. While you’re soaking the clams, make scallion oil. Pour oil in a small sauce pan and heat over medium low heat. Chop a few scallions – white and green parts – and drop them in the hot oil. Stir briefly until the onions just begin to cook and then take off the stove to cool completely. You’ll want to drizzle this scallion oil on vegetables, grilled meats and fish. It adds a ton of flavor to any dish. Grill the clams until they open and remove the top shell, arranging on a platter. 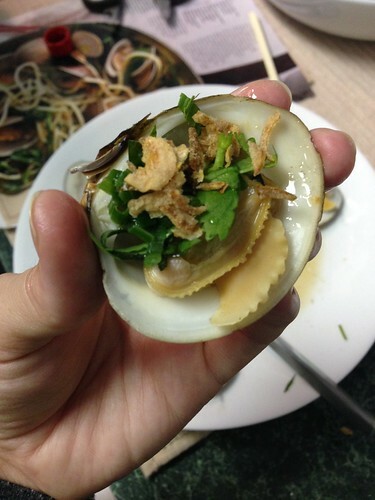 Top the clams with fresh chopped basil and peanuts and then drizzle some nuoc mam, scallion oil, and crispy shallot. That’s all it takes! Try them this weekend! Oh, and here’s the main course of pasta with clams, arugula and fresh basil that was OH so delicious. I will be making this many, many times over. Instead of linguine I used bucatini, which is a spaghetti-like pasta that is actually a long, hollow tube. This is perfect for the clam sauce as it gets sucked up the middle and you get even more flavor from the delicious, briny broth. I also slow roasted heirloom cherry tomatoes and added to the broth just before serving – a perfect flavor boost. This has been quite the week. 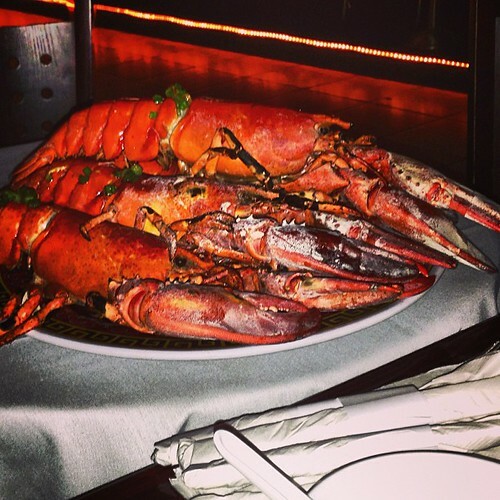 First crawfish, then came the lobsters. What crustacean comes next? Apparently Claude, the Tasmanian Monster Crab. Seriously, folks. Last night we met some friends at Eden Center, once again, club slash restaurant slash karaoke bar slash bar V3 Lounge. Known as the “Gem of Virginia” according to one web search. Interesting. They don’t seem to separate their many identities, regardless the time of day or day of week. The appropriate invitation to dinner may be: Yo shawty, let’s go to da club and our grub on. Thursday night is all of the above, but they also have $10 lobsters. V3 is a great spot for đồ ăn nhậu, or (loosely translated) drinking food or literally (according to Google Translate) it is “drink, food“. These are dishes that may not make a great meal all at once, but are served while drinking over a long period of time that you pick at with a group of friends. Think football games, warm days on the deck and long nights under the stars. These are some of my favorite foods. These aren’t sad, wimpy Lobsterfest lobsters. They’re pretty hefty week after week. Meet our first course buddies: these bad boys were grilled and topped with Scallion Oil, or Mỡ Hành. 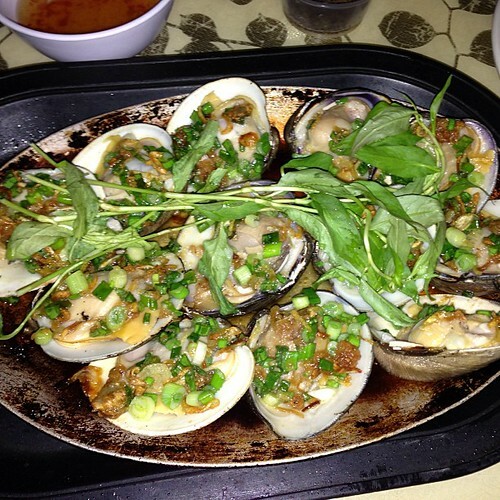 We also started with these amazing grilled clams, topped with the same Scallion Oil, fried scallions and peanuts. Like a fish fry, a big grilled fish, tons of veggies and herbs with rice paper rolls is a great way to spend a family Sunday. So fresh, so satisfying, so HEALTHY. Have I mentioned that Vietnamese cooking is healthy? You can eat everything and not feel guilty about it. Mom and Dad made a run down to the house to give us a poker table Pap Pap (my dad’s dad) made by hand years and years ago. It was pretty cool to hear stories of nickle, dime, quarter poker games being held at my Dad’s childhood home with local police and other folks. He said the cops always took off their guns and left them on the pool table. Safety first, you know. Anyways. I wanted to make something that they would enjoy but would also fit with Mom’s diet as she’s counting down to fabulous for our wedding day. Bánh tráng cuốn cá, Rice Paper Rolls with Fish, was a perfect choice. The only ‘cooking’ required is to toss the fish on the grill. 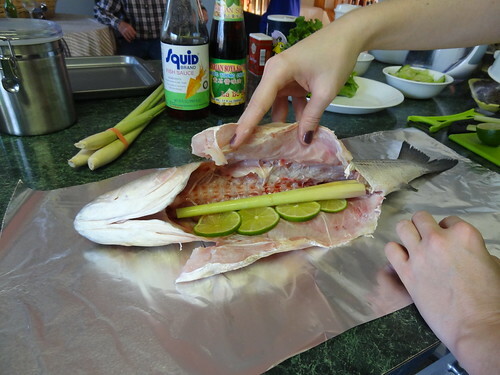 My parents aren’t quite sure about fish sauce just yet, so I wanted to fragrance the fish in case they ate the rolls plain and stuffed the fish with a lemongrass stalk and a few slices of lime. This is totally optional.